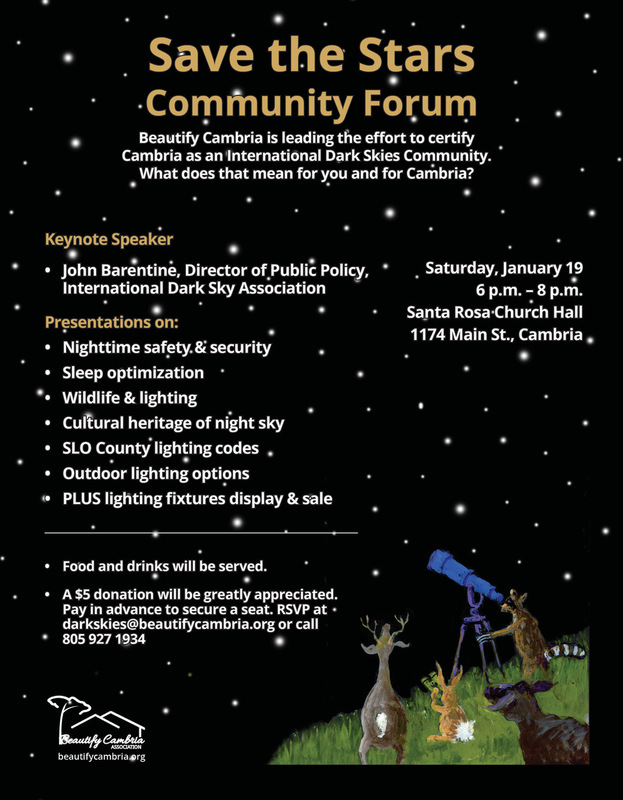 For slightly over a year now, the Beautify Cambria Association has been spearheading an effort to update outdoor lighting ordinances and promote dark-sky friendly lighting to protect the nocturnal environment and our heritage of star filled skies over Cambria and adjacent north coast areas. You are all cordially invited to enjoy food, drink, and a diverse forum of speakers at our Save the Stars Community Forum to be held at Santa Rosa Church, 1174 Main Street in Cambria starting at 6pm this Saturday, January 19. The keynote speaker will be astronomer John Barentine of the International Dark Sky Association which has been in the forefront of the effort to preserve natural night skies around the world. Come learn more about what we can do to ensure our children and grandchildren will be able to view wonderous star-filled skies right here in SLO County. See the attached flyer for additional details. I Hope to see you there!